Rarely does any food have the diversity of polenta, and because polenta nutrition is high, no one should have reservations about adding polenta to their diet. Polenta can be boiled, fried, baked, grilled, microwaved and served for breakfast, lunch or dinner. It is so versatile that it can be served as a meal or as a dessert. Polenta is just now gaining a big following in the United States. It has been a staple of the people of Northern Italy since the 1700s. 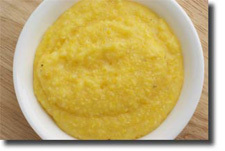 Polenta is cornmeal that is simmered in water to make a creamy type of porridge. In Italy, polenta is made from fresh corn with special pots and ladles to make an exquisitely delicious version. While polenta is eaten for breakfast, it is far from just a breakfast meal as many Americans tend to think. Polenta is used as an alternative to potatoes and pasta. It is often eaten with butter or Parmesan and other cheeses. It is made into casseroles and lasagna-type dishes and covered with tomato sauces. Add fennel, red peppers, zucchini, olives, garlic, milk, any combination of meats--beef, chicken, pork, sausages and sauces of every type. You can make polenta into patties and squares and grill or fry it. You can even make pancakes and shortcake out of polenta. Visit any gourmet restaurant and you are sure to find one if not more polenta creations on the menu. It is served with lobster, salmon, and many delicacies. If you don’t want to make your own polenta, you can buy it pre-cooked in tubes at the grocery store. Just don’t tell any Italians how you didn’t make it yourself. You might think that any food that’s so versatile must be bad for you but it’s not. Polenta nutrition is not the highest in the world but depending on how you prepare it, is falls into the healthy category. Both yellow and white cornmeal are used to make polenta and the best health-wise is stone-ground whole grain cornmeal. If you buy cornmeal which has had the germ layer removed, it will be less nutritious. One of the good things about polenta is that it is not processed. Polenta nutrition comes from its starches, carotenes, fats, vitamins and minerals. It is a complex carbohydrate, meaning it is on the low end of the glycemic index and that it will break down slowly in the blood and eventually be converted to Vitamin A. Corn has a good amount of protein but it does not have the essential amino acids, lysine and tryptophan. Even though polenta is high in niacin it is not a version the human body can use. In many countries polenta is eaten by the poor during tough economic times and people have become ill from lack of niacin. In fact, it has happened in the last two centuries in the southern part of the United States. Polenta has 10% of the RDA for vitamin C and 25% of the RDA for folacin. If you eat polenta from yellow corn, you will get 6% of your daily need for Vitamin A (beta carotene) but none of it if white corn is used. Polenta made from whole-grain corn can supply good amounts of iron, thiamin, zinc, phosphorus and magnesium. It’s also a good source of fiber. While you might think you should avoid foods like polenta because of the high carbohydrate content, this is really not true. The fiber in polenta can help prevent diseases and because it is made up of complex carbohydrates, it can help control glucose levels. Zinc contributes to a healthy immune system. For those of you who cannot eat gluten, polenta is a good grain alternative. Because it takes so long to make polenta--a minimum of 45 minutes of constant stirring (it’s lumpy), you may want to first try out the store-bought polenta. Once you discover polenta, chances are you will want to serve it in many ways and take full advantage of polenta nutrition.